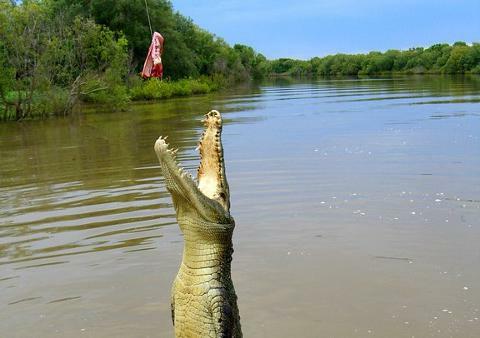 Cruise on the Adelaide River, home to over 1,600 crocodiles, on the Jumping Crocodile cruise. See these prehistoric creatures up-close as your local guide entices the crocodiles to leap out of the water. Then you’ll travel into Kakadu National Park. 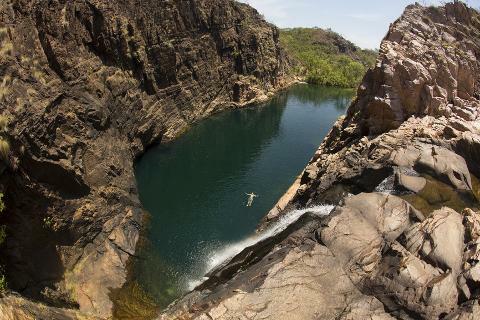 Covering more than 19,800 square kilometres, World Heritage listed Kakadu is the largest national park in Australia. The combination of mangrove fringed coastal areas, expansive flood plains, lowland hills, and open woodland and forest habitats, make Kakadu one of the most diverse landscapes you’ll ever experience. It’s home to a myriad of animals, hundreds of bird species and thousands of different insects and plants. Stop at the Bowali Visitor Centre then continue to Ubirr, where you’ll climb up through the ancient Aboriginal rock art galleries, believed to be 20,000 years old, to the lookout for the view over the surrounding wetlands. You’ll be mesmerized as you wander around the Nourlangie rock art site. It has provided shelter to the indigenous people for many thousands of years, and while taking shelter, the rock evolved into a canvas that illustrates their very deep spiritual culture. With your Driver Guide, you’ll have the opportunity to see many different forms of Aboriginal rock art paintings. The Bininj people are the traditional custodians of Kakadu and now you’ll visit the Warradjan Cultural Centre to introduce you to their way of life. Later, join your local guide for a cruise on the Yellow Water Billabong, Kakadu’s most famous wetland. The picturesque yellow waters are home to thousands of saltwater crocodiles and up to 60 species of colourful birdlife. This afternoon travel to Katherine, the third largest town in the Northern Territory. 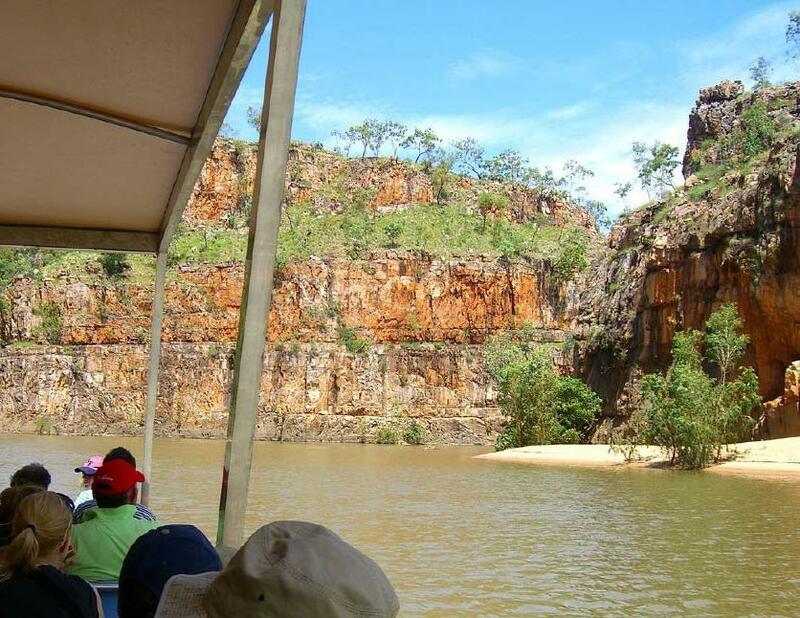 Enjoy a morning cruise through Katherine Gorge. 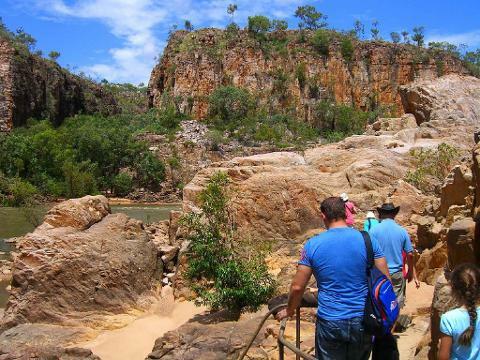 One of the most visited sites in Australia’s Top End, it is a stunning network of thirteen gorges carved from billion year old sandstone that are home to many rapids and falls, flowing from the Katherine River. The cruise will put you at the heart of Katherine Gorge among freshwater crocodiles, wonderful birdlife and some of the most amazing scenery the Northern Territory has to offer. Afterwards proceed to the Nitmiluk Visitor Centre. The Display Centre and Heritage Museum features large scale models illustrating the flora, fauna and rock formations of the park. If you would like to purchase your own memory of Nitmiluk, the centre has a range of souvenirs and artefacts handmade by the Jawoyn people. Next stop is Leliyn (Edith Falls). The paperbark and pandanus fringed natural pool at the base of the falls is suitable for swimming throughout most of the year (conditions permitting). Return to Darwin via Pine Creek, an historic gold mining town and stop at the Adelaide River War Cemetery, the resting place for many of those killed in the World War II air raids on Darwin. Green season itinerary operates Nov- Apr see tour DG52 (Day 2 overnight in Darwin instead of Katherine).